Spearfishing fins, how to choose the right spearfishing fin. A good pair of spearfishing fins need to be tough, reactive and comfortable. Spearo’s don’t do a single P.B dive for the day in a controlled environment and call it quits for the day like freedivers do. They dive all day in amongst the reef and rubble, in the swell and the rocks searching for the next feed of fish. The following article is for those looking to understand what makes a good pair of spearfishing fins and how to choose the best pair for them. Spearo’s generally use specialised spearfishing fins that are longer and narrower than scuba fins. They are designed to give maximum efficiency from the energy that the diver expends on kicking, thus reducing oxygen consumption and improving the amount of time the diver can be underwater hunting. Though these types of fins can be fast and powerful the emphasis is more on efficiency rather than power. Spearfishing fins generally come in three main types of material and of course price range. At the top, there is carbon fibre followed by fibreglass and at the bottom end thermoplastic. Each has their pro’s and con’s which we will discuss. There is a lot to consider when choosing a spearfishing fin. The first thing is the fit. The foot pocket should be tight enough that your foot isn’t going to roll around inside the pocket. Rolling inside the foot pocket will cause you to lose power transfer through the blade. The blade will also not run true behind the foot and you will lose efficiency through water spillage as the fin blade twists. The foot pocket must also not be too tight or it will be uncomfortable and can cause cramping in the foot. One thing to consider when sizing up foot pockets is the thickness of the dive sock you will be wearing. The second thing to consider is the stiffness of the blade. Getting the right blade stiffness for you is crucial to maximising your efficiency and improving your dive time. There are three general stiffness’ available off the shelf. Hard, medium and soft. Which stiffness you choose depends on your body type. For example my mate Shrek weighs in at over 120kg, he’s a big unit and he requires a stiffer fin to get him moving. I’m only 80 kg on a good day after a rump steak and I have a pair of legs that are made up mostly of hair with a bone centre and something under the skin that resembles a calf muscle. I therefore use a much softer fin than Shrek does. If I was to use a stiff fin I would have to work very hard to move them and burn up my oxygen reserves quickly. Alternatively Shrek kicks like hell in my soft fins and goes nowhere. The third thing to consider is price and material which generally go hand in hand. Carbon fibre and fibreglass are the most expensive but are definitely the clear favourites when it comes to performance. Fibreglass and carbon fibre spearfishing fins are generally a two part system. The blade and the rubber foot pocket. They can be bought separately or as a package so it can pay to shop around. The blade should have a good rail down the sides to help stabilise the fin and channel the water down the full length of the blade. Fin blades are generally made thicker at the base of the toe and become thinner towards the tail of the fin. This gives the fin a hyperbolic curve or J-curve and is considered essential for good efficiency. The foot pocket base below the foot should be stiff to impart power from the foot to the blade. The foot pocket has a rail on each side and this can have an effect on the stiffness of the blade as well. Most manufacturers will have a preferred foot pocket for their blades. Plastic bladed spearfishing fins alongside Carbon Fibre Penetrator spearfishing fins. Note the full length rail on the Penetrator fins. Plastic fins are generally the cheapest fin and this is where a lot of people like myself started. The blade and the foot pocket are generally moulded all in one piece. They are the least reactive of the three materials and are therefore considered the least efficient. They are by far the cheapest and a good pair can be a very tough piece of equipment and are great for thrashing on the rocks. My Cressi Gara fins lasted me for years and were well worth the investment. My recommendation for this category is the Cressi Gara blades. These were my first freediving blades and lasted me for years. One of my regular dive partners Benny Harper swears by the Beuchat Mundial Elite fins which also look nice and last well. This is where the real difference begins. Fibreglass or composite fins are extremely reactive and efficient. They are closer in quality to carbon fibre than they are to plastic and are tougher than carbon fibre. These are extremely popular with spearo’s due to their good reactivity and tough composition. Many a spearo has an ancient scuffed up pair of composite spearfishing fins which they will swear by. My recommendation for this category is the Penetrator composites available here for the exclusive Noob Spearo design or here for the rest of the range. Another well-known fin brand is the DiveR available here. Carbon Fibre is the most reactive and efficient material for spearfishing fins. Here I demonstrate just how reactive it is. The J-curve produced by a good quality spearfishing fin. 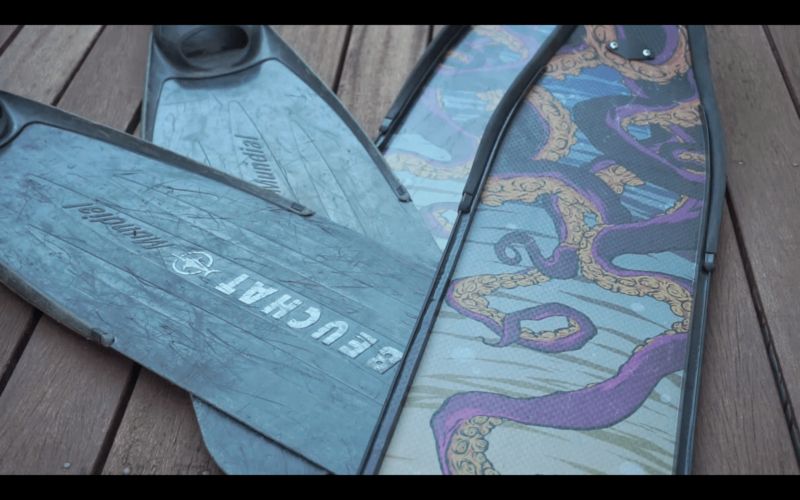 The creme de la creme of spearfishing fins. They are the most expensive in the range and also the most reactive and lightest of all the materials used to produce fins. They are considered to be more fragile than fibreglass/composite fins so may not take your dive partners walking all over them on the deck or being sat on on the rocks. Having said that I have not yet had a problem. I recommend Penetrator Carbon Fibre blades (Noob Spearo design) or the full range here. To get to know the man behind these fins, listen to our Larry Gray episode here, you’re sure to learn something about freediving fins. I have been using these fins for quite a while now and found them to be excellent. Another option is the Dive R blades which are also popular here. Last but not least. Not all fins are created equal! This is particularly true of carbon and composite fins. In the past, I have purchased fins with a low price point claiming to be carbon fibre that simply don’t perform like carbon fibre should. Go with a trusted brand and if it seems to good to be true, then it probably is. I use and recommend Penetrator fins. I have used both the composite and carbon fibre models and thoroughly recommend them. If you would like a set of Penetrator fins you can purchase them through our website or the penetrator website. If you choose to purchase another option through spearfishing.com.au remember to use the “noobspearo” code at checkout to save $20. If you would like to learn more about spearfishing go to our getting started section here or check out our 99 Tips to get better at spearfishing available on Amazon.